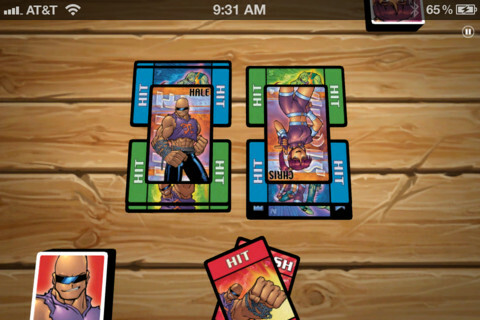 BRAWL is a fast paced card game app for the iPhone. The concept of BRAWL is simple: Give the players a deck of cards to play and fight against their opponent by matching the most cards on their side. A central card is placed on the playing table, and each player must add a matching card (based on color) to this central card, otherwise known as a base. This central card is nothing more than a picture of your character or your enemy’s character; it’s only there so you can place your matching cards under it. Not only do you have cards to match with each other, but you also have “Clear” and “Freeze” cards. The Clear card wipes a whole base off of the table (there can be up to three bases at once), and the Freeze card will make a base untouchable. At the end of the match, you get a point for each base you claimed, which is decided by how many matching colored cards you have under the central card. The match only ends when all bases are frozen using the Freeze card, or when all cards are gone. Players can pick one of three different characters, which each have their own stats and deck. BRAWL is a free app, so keep in mind that Jalapeño, the developers, are going to try to make money one way or another. Instead of limiting the features of the app or filling the application with advertisements, Jalapeño instead decided to add three extra characters, each costing $1.99. Personally, I think the characters and their decks don’t justify the $1.99 price tag, but I found it to be an excellent way of throwing the developers a couple extra bucks. There are two different modes in BRAWL. The first is Vs. AI, which allows you to pick a player and an opponent. BRAWL offers three different difficulties: Normal, Hard, and Insane. Playing on Normal was a challenge for me, so I can’t imagine how hard it would be to win a match on Hard or Insane. The second mode is Online, but unfortunately, not enough people play BRAWL to be able to have an active online community. I had a hard time finding an enemy using Game Center’s multiplayer, but on my third try, I was finally matched up against someone. Whether you’re looking for a fun card game or just trying to kill a few minutes of your time, BRAWL is a great iPad , iPod Touch , or iPhone app . You can try it for yourself without spending a penny – it’s free! -$1.99 price tag on extra characters. AppSafari review of BRAWL was written by Darius Reimm on November 18th, 2011 and categorized under App Store, Board, Free, Games, iPad apps, Multiplayer, Universal. Page viewed 4349 times, 1 so far today. Need help on using these apps? Please read the Help Page.